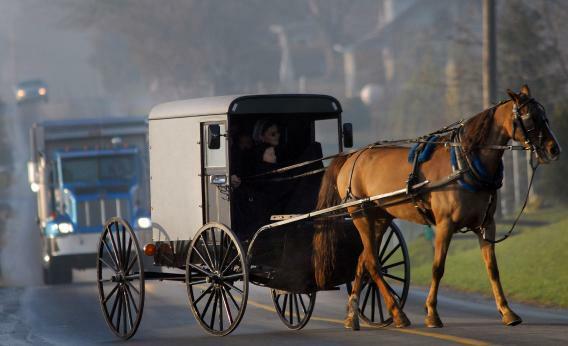 The Amish have to think carefully about how they interact with technology—like cars. This article also appears on As We Now Think, a site edited by the Consortium for Science, Policy, and Outcomes at Arizona State University. ASU is a partner in Future Tense with Slate and the New America Foundation. I know. You own a slim titanium ultrabook computer, an eye popping LCD 3D HD television, an iPhone with a custom-designed carbon fiber cover, and a sports car with 360 horsepower under the hood. You don’t have anything in common with the Amish. It’s possible. But there are a lot of us who are beginning to adopt some practices that are pretty close to the Amish. No, I’m not talking about the Amish belief in adult baptism or the importance of farming in daily life. I’m talking about the decisions the Amish make about technology. More and more of us have begun to think about the impact that technology has on our relationships with others and we’ve begun to alter our practices. Contrary to many stereotypes, the Amish actually use a lot of technology. I’ve seen Amish ride in cars, use power tools, and fire up a 600 horsepower Rolls-Royce generator. But the Amish won’t use just any technology that is developed. And they don’t allow technologies to be used by anybody whenever they want. They have developed a complex set of unwritten rules that guide their daily decisions. - You can ask a neighbor for a car ride to the grocery store, but you can’t own a car. - You can use an air-powered pneumatic belt sander, but you can’t use a sander that plugs into AC power. - And you can have a community phone booth outside your carpentry shop, but you can’t have a telephone inside your house. Why allow the use of pneumatic belt sanders? The Amish believe that when their people work for non-Amish employers, they are distracted from their religious holidays and fellow community members. Amish businesses are very important so that church members don’t have to travel far from the community to find work. As our carpentry shops became more industrialized, the Amish couldn’t compete. As such, they’ve begun to slowly introduce automatic hand tools. So why not just buy an electric sander? Well, the Amish like to put their own stamp on technology—by designing and building their own pneumatic sanders, they can still identify as being different from us. And why allow the use of phones outside of the house rather than inside the house? Again, Amish businesses are important, and if an Amish farmer wants to sell his milk to a local dairy, he’s going to have to be in phone contact every once in a while. But the home is a place the Amish believe they should protect. If they must use new technologies to compete in business, the least they can do is protect their home from outside distractions. I think there are a lot of Amish practices that we won’t ever develop. For instance, our identity is wrapped up in using technologies, rather than not using technologies. And I don’t see us giving up automobiles anytime soon. But I’m often struck by how much we are beginning to identify with the Amish justification for not having telephones inside the house. Increasingly, there are complaints by people that technologies like e-mail, Facebook, and cellphones are disturbing the relationships they hold most dear. To combat this, many of us have developed rules. It’s hard to find a family that hasn’t specifically developed a rule that prohibits cellphones, texting, and e-mail from the dinner table. Many families believe that dinner is an important time and space to share just with the people who are present. We therefore limit the use of certain technologies to maximize our face-to-face interactions. Every time you create a rule—or even grudgingly abide by your loved one’s request—to turn off or disconnect from your phone/e-mail/Twitter/Facebook/etc. when you are spending time with family or loved ones, you are embracing an Amish value. That’s not to say that you dislike those technologies, but rather that you’ve decided to carve out a part of your life where you don’t use them. The more we seek to maximize our values by carefully delineating how, why, and when we use technology we’re becoming a bit more Amish. And, by the way, some of the Amish might be becoming more like us. There are rumors that cellphone use is become widespread in Amish communities. “But wait!” you say. “That violates all of their principles.” Yes, it does. But just as it is for us, the ability to communicate with friends and loved ones immediately and across long distances is very enticing to the Amish. And if you can get that power in a tiny technology that you can hide in your pocket and use when you’re in the privacy of your own house, it could be a temptation that you just might not be able to resist. It’s hard to follow the rules when you can’t be caught breaking them. The Amish have learned a lot about technology by watching us use it. They basically use us as an experiment to see what happens to a society when it adopts certain technologies. We should probably let them know that cell phones may not quite be the unmitigated good they can seem at first glance. Maybe they’ll take a cue from us and ban them from the dinner table. For more about the Amish use of technology, see Jameson Wetmore’s IEEE Technology & Society article.